Students at Fordham University complain that the Catholic school won't prescribe birth control at its campus clinics — and that this policy isn't made clear to incoming students. Now they're hosting an off-campus clinic as an alternative. 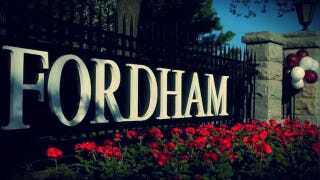 Fordham University prohibits the prescription of contraception in its health centers and the distribution of condoms on its campuses. Students who purchase insurance from Fordham incur a $100 "per condition" deductible to see an off-campus doctor for birth control; for students who learn of the school's policies only after visiting a Fordham health center, this may be in addition to the cost of an annual exam at Fordham. Fordham administrators and health center staff say there is a health exception to the undocumented prescription ban, but in practice students have been turned away even with records of serious medical conditions. [She] had an ovary and an abdominal mass removed and her doctor told her she needed to be on hormonal contraception forever. She is gay and definitely didn't need it for birth control. She offered to bring in her medical files, but was told to get a letter from her doctor — who is across the country and charges $25 for a letter. Dunlap notes that FLSRJ has asked the administration multiple times to make its birth control policies clearer so that incoming students will be aware they won't be able to get their prescriptions filled on campus. As of now, the university appears to have ignored their requests. The women's health section of Fordham's Student Health Services website reads only, "Women's Health Care Services are available for all female students at the RoseHill and Lincoln Center campuses. Routine gynecological examinations, including pap smears are available by appointment. Please call appropiate center for hours." The 2011-2012 student health plan booklet has this to say about the plan's "Contraceptive Services Expense Benefit": "The Insurer is required by law to offer this coverage and pay the Covered Percentage of the Covered Charges for Contraceptive Drugs and Devices. Such Drugs and Devices must be approved by the United States Food and Drug Administration and prescribed legally by an authorized health care provider." In order to find out that campus clinics don't offer birth control, you'd have to visit the health service's Mission Statement page, which says "the physicians, nurse practitioners, and staff of the Health Center abide by the Ethical and Religious Directives for Catholic Health Care Services" and links to a 43-page PDF document issued by the United States Conference of Catholic Bishops. On page 27, this document states, "Catholic health institutions may not promote or condone contraceptive practices but should provide, for married couples and the medical staff who counsel them, instruction both about the Church's teaching on responsible parenthood and in methods of natural family planning." As a post on the FLSRJ's blog notes, the document does not "describe any policies specific to Fordham." When I called Student Health Services to ask if on-campus facilities prescribed birth control, I was told "no, because this is a Jesuit university." But many incoming students may not know to call ahead. Says the FLSRJ post, "It is reasonable for a student to assume her yearly gynecological exam will include attention to both her reproductive and general health." In response to this lack of transparency, the FLSRJ has organized Prescribe Fordham, an off-campus clinic hosted at the New York Institute of Technology this Wednesday. The clinic will feature "local health care providers from the Institute for Family Health to prescribe birth control to Fordham students and answer questions about sexual health" as well as free condoms. As Above the Law noted, the clinic was originally scheduled to take place at a different location about a block away. Dunlap writes that the owners of that location "decided suddenly and unexpectedly not to honor the rental contract." She adds, "Organizers of the clinic have been investigated by the University and may be subject to disciplinary action." I've contacted Fordham's Dean of Student Services to find out if the university does indeed plan to discipline its students for distributing birth control off campus — I'm still waiting for a response. No students are facing disciplinary action for the off-site clinic, nor will they be. The actual student health insurance policy is very explicit about what is and isn't covered, including coverage of birth control; the University website less so. We've heard the students' concern on this, and may in fact edit the web copy to be more specific, but it's a fine line: we don't detail coverage on non-birth control provisions, either. We are a Catholic university and do follow church teachings on birth control, among other issues. We don't believe that stance is a surprise to our students.